I am quite sure that having one wife is more than what a man can handle, but to be married to more than one will certainly induce plenty of headache unless you have bottomless pockets! Well, here is a sport that you might want to play with your wives if you happen to be married to three of them, but I feel that the target market of this $249.99 Quad Table Tennis Game would be a group of friends rather than a cuckolded husband. The name of the game itself gives the scenario away, where it introduces a new twist to a traditional sport, boasting four separate tables that pits up to four players against one another. This delivers unpredictable, exciting play indoors or outdoors, and you can hit the ball onto any opposing player’s table. Make sure your reflexes are in tip top condition, as angled bounces and caroms are the order of the day. 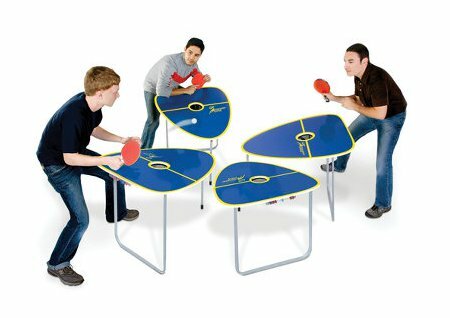 The tables are placed just a few feet apart facing one another, where each triangular-shaped, 24″ long x 18″ wide table will taper to a round point in the front; while the back edge is pitched 10º, ensuring the balls will bounce up towards a player. I wonder what happens when the Chinese master this game. I don’t think that this will ever make it as an Olympic event though – what about you?